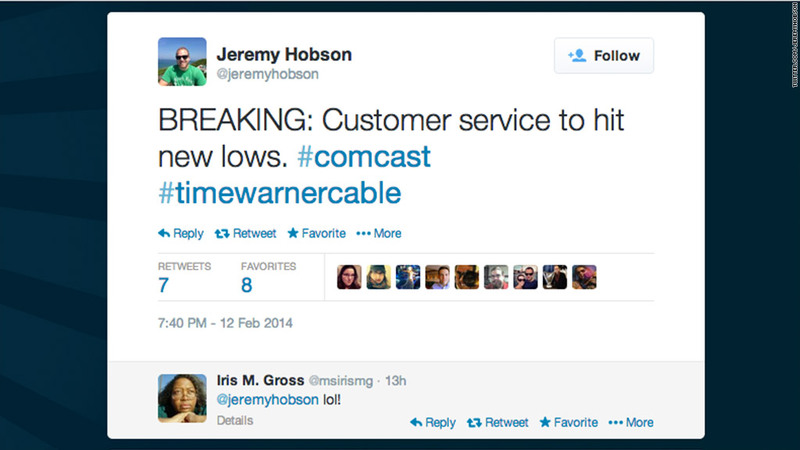 Everyone seems to hate their cable company, and news that Comcast wants to buy Time Warner Cable isn't going over well. Customers of both are trying to out-do each other, warning of high prices, slow data speeds and miserable customer service. On Twitter, the knee jerk reaction was almost unanimously negative. "Sweet. We will never have affordable, high-speed internet in this country," said Allen Christopher of Winston-Salem, N.C.
"In what way is this not a catastrophe for competition in an industry that is already terrible for consumers?" asked Benjamin Harrison of Brooklyn, New York. David Hoang in Seattle put it best: "Comcast acquiring Time Warner Cable is like Nickelback and Creed deciding to go on tour together." For their part, Comcast and Time Warner Cable say there's plenty of industry competition and customers will be better off. They say the merger will bring higher broadband speeds, faster in-home Wi-Fi and quicken releases of new products. "Comcast and Time Warner Cable have been the leaders in all of the industry's most important innovations of the last 25 years and this merger will accelerate the pace of that innovation," said Time Warner Cable CEO Robert Marcus. In reality, though, the merger would bring together two companies that consistently fail to satisfy their clients. Last year, the American Consumer Satisfaction Index ranked both companies' television and Internet services the lowest in the nation. Their ratings were far behind Verizon's (VZ) FiOS, DirecTV (DTV), AT&T's (T) U-verse and Dish Network (DISH). Their telephone service didn't score much better. Both have had plenty of dings to their reputations. In March, New York State's attorney general forced Time Warner Cable (TWC) to pay $2.2 million for overcharging 18,437 customers. In December, it agreed to pay $1.9 million after the Federal Trade Commission found the company was secretly judging customers' credit reports and charging them more if their scores were poor. 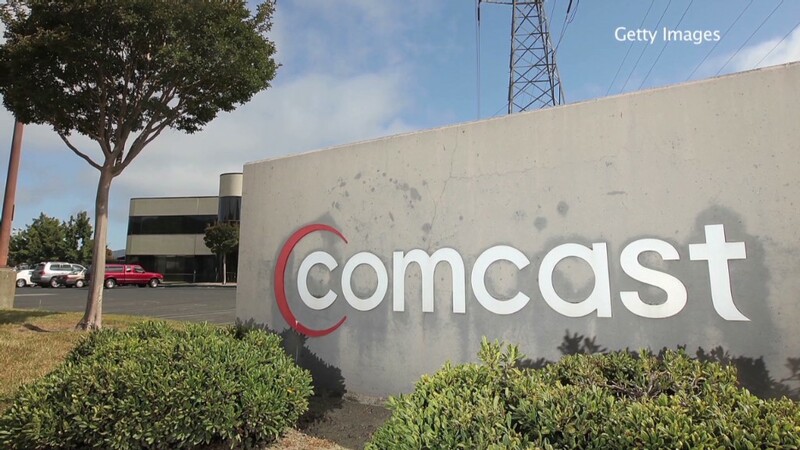 Customers have launched more than 23,000 complaints against Comcast (CMCSA) and filed overwhelmingly negative reviews. Time Warner Cable was spun off from Time Warner in 2009 and no longer has any connection to the owner of CNN, HBO and Warner Bros. The fear now is that forming one giant company will make it a monster with too much power -- and zero accountability to everyday Americans. Dean La Velle is a marketing consultant in Quincy, Ill., who had Time Warner Cable a decade ago in Florida and now uses Comcast. He doesn't care for either company and worries a merger will eliminate competition. "It hobbles capitalism," he said. "My fear is that over time they're going to have enough of the market that they become the dominant player and have no incentive to make service better. It'll stifle innovation like it did with the phone companies." Don Gelfund, a Comcast customer just outside Chicago, said that's already the case and the merger would only make things worse. "When you call and threaten to unhook, they all but laugh," he said. Those angry about the deal hope the nation's attorney general will step in on their behalf. AJ Wilcox of Lehi, Utah., said this on Twitter: "Feds, please kill the Comcast/Time Warner deal. I'm against government intervention, but this is one oligopoly that is way too strong."